It’s another of those projects that has spent longer in the bits box than on the workbench, but as my OO9 pipeline dries up (i.e. I’ve now done all the easy ones) I’ve started to look again at the union of Parkside Dundas W&L Hunslet and the Roco outside-framed chassis that I started last year. One of the reasons it stalled before was the difficulty of modifying the cast whitemetal footplate from the kit to fit around a mechanism it wasn’t designed for. Already fairly fragile, I managed to break it a couple of times and eventually concluded that it needed too much metal removing from an awkward spot that would make it too weak to be reliable. So this time around I switched to making a styrene replacement, which was a much better fit but I was still worried about it flexing under the weight of a large metal body. But as luck would have it, a friend of mine has a 7mm scale kit business, and a pantograph milling machine and… you can see where this is going. After confirming the new footplate design was suitable, I set about making a 4x actual size styrene pattern. A pantograph machine works by transferring dimensions from a large scale pattern to the final material using a linkage of arms. 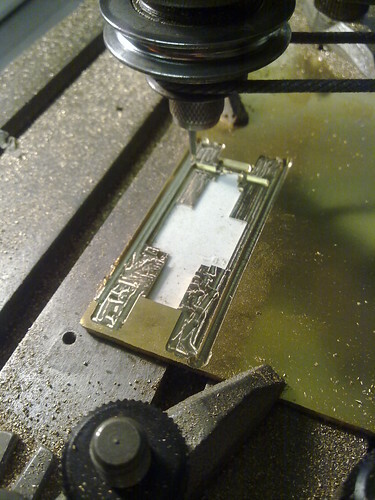 By running the guide piece against the shapes of the pattern, it directs a high speed cutter to mill brass sheet into a much more solid replica of my footplate. 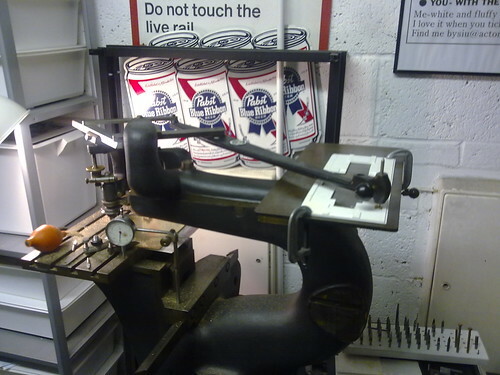 For something that feels like it should be quite a nerve-wracking operation, using the pantograph is actually a breeze, with tactile feedback from the cutting head through the arms so that you can “feel” when a cut is through at the other end. 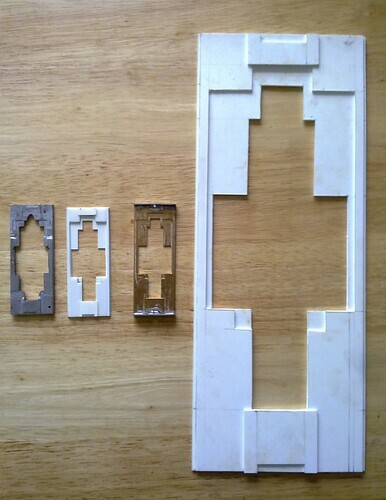 The result, a footplate piece that is exactly four times smaller than the pattern and pretty much exactly the same size as the original styrene test piece. By reducing from a larger pattern, any errors are also reduced and the brass piece is a firm push fit on to the Roco chassis. So with the donor loco’s boiler and smokebox also cut down to fit inside the kit’s boiler and tanks, it’s time to get on with the rest of it! 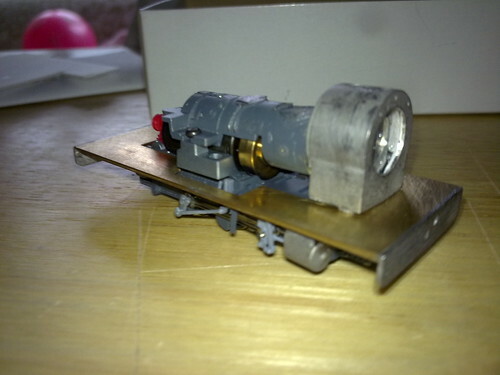 This entry was posted in 009, chassis, hacks, hunslet, kits, model railways, narrow gauge. Bookmark the permalink. I’m currently negotiating for the purchase of a Roco loco having already bought the Parkside Dundas kit so am very interested in what you’re doing. Any chance of buying a footplate from you ? I had thought of cutting one out from sheet brass but buying a ready made one would save me a lot of work. I would be interested to hear of progress you’ve made on the loco since this article. Regards, Graham. I did a bit more work on the body but nothing substantial. Really must get around to it. The footplate was a bit of a one-off really but I do still have the pattern for it, which you could have to supply to someone else with a milling machine.